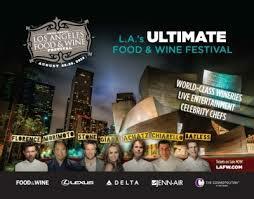 Los Angeles Food & Wine Festival August 22-25. Get your tix! (LOS ANGELES, CA; June 21, 2013)—Coastal Luxury Management, the producers behind Pebble Beach Food & Wine and Harvest Farm-to-Table, announce the third annual Los Angeles Food & Wine Festival taking place August 22-25, 2013. Set in the heart of the country’s premier cultural destination in Downtown Los Angeles, amid the majestic Walt Disney Concert Hall and boasting views of distinguished marquee landmarks including the Music Center and City Hall, the culinary world’s most storied luminaries will come together for festivities that will take over the heart of the city for a three-night, four-day epicurean extravaganza. “It has been a pleasure to witness the success of this event first hand”, Mayor Antonio Villaraigosa said. “The size, scope, and quality of the festival only add to the momentum Los Angeles has experienced as a place where culinary enthusiasts from around the world should visit frequently. Festa Italiana – Thursday, August 22, 2013, 7:00-10 p. m.
Hosted by beloved television personality and culinary talent Giada De Laurentiis, the opening-night celebration will embrace all things Italian including authentic Italian food, beer, and cocktails. Joined by chefs including Scott Conant, Celestino Drago, and SPQR’s Matthew Accarrino, the kick-off is poised to be a “buona sera” to remember. Asian Night Market – Friday, August 23, 2013, at 7:00-10 p.m.
“Iron Chef” Morimoto hosts a unique take on the Asian Night Market featuring cherished fine dining establishments alongside mom-and-pop neighborhood eateries. Over 30 restaurateurs including David Myers, Ricardo Zarate, and David Lefevre, handcrafted cocktails, and traditional spirits will be showcased at this celebratory event. Live on the Avenue – Saturday, August 24, 2013, 7:00-10 p.m.
Top Chef Masters’ Host Curtis Stone welcomes guests to this unbelievable strolling reception culminating in a show-stopping performance set against some of L.A.’s most iconic buildings and architectural landmarks, featuring luminary talent that includes Rick Bayless, Grant Achatz, and many more. Lexus Grand Tasting – Saturday, August 24, and Sunday, August 25, 2013, 12:00–3 p.m. Enjoy one of the nation’s most decadent walk-around tastings featuring 30 celebrity chefs, 200 coveted wines from top-name wineries, and opportunities to interact and photograph the food world’s most lauded names—all under one roof. Additionally, events will take place throughout the city during the four-day celebration —from Beverly Hills to Santa Monica—as participants have the opportunity to partake in themed lunches, and events featuring prominent chef collaborations and one-of-a-kind experiences with details forthcoming. “Los Angeles Food & Wine has become one of the most anticipated events of the summer,” says Giada De Laurentiis. “I’m excited to return and cook alongside many of my closest friends, fellow chefs, and some of the most amazing talent I truly admire.” Tickets are available starting today Friday, June 21, 2013 and can be purchased at http://www.lafw.com including full- and half-day packages, as well as specialty ticketed events throughout the city. Now in its third year, the Los Angeles Food & Wine Festival is a four-day epicurean event showcasing the finest in food and drink culture throughout Los Angeles and culinary personalities from throughout the country. Based amid one of the country’s foremost cultural destinations along Grand Avenue, the event spans the city and offers guests the chance to sample the cuisines and products from some of the most prominent epicurean influencers, while enjoying the sights and sounds of the entertainment industry’s brightest talents. The star-studded lineup has included celebrated chefs such as Wolfgang Puck, Guy Fieri, Giada De Laurentiis, Daniel Boulud, Tyler Florence, Scott Conant, Michael Chiarello, and local favorites Rory Hermann, Michael Voltaggio, Matsuhia Nobu, and Sang Yoon. For more information, please visit www.lafw.com/.